1. The Lowells and Their Seven Worlds. 2. Annals of the Lowell Observatory. 5. Annals of the Lowell Observatory. 1. The Lowells and Their Seven Worlds. With Illustrations. 2. Annals of the Lowell Observatory. Volume I. Observations of the Planet Mars During the Opposition of 1894-5 Made at Flagstaff, Arizona. WITH: LOWELL. Annals of the Lowell Observatory. Volume II. Observations of the Planet Jupiter and its Satellites 1894 and 1895. II. Observations of Mars 1896 and 1897 Made at Flagstaff, Arizona, and Tacubaya, Mexico. WITH: LOWELL. Annals of the Lowell Observatory. Volume III. Observations of the Planet Mars During the Oppositions of 1894, 1896, 1898, 1901 and 1903 Made at Flagstaff, Arizona. 3. Lowell Observatory photographs of the planets. 4. New observations of the planet Mercury. 5. Annals of the Lowell Observatory. Volume III. Observations of the Planet Mars During the Oppositions of 1894, 1896, 1898, 1901 and 1903 Made at Flagstaff, Arizona. 7. The soul of the Far East. by Percival Lowell. 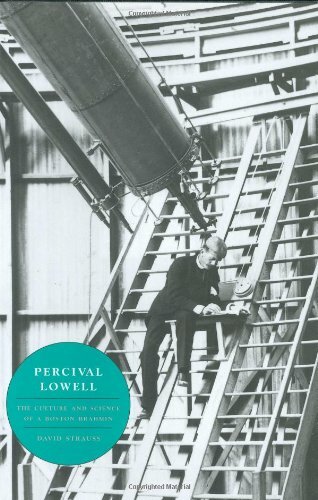 The first fully satisfying biography of a man who helped to change astronomy, sustained its popularity and mystery, and tested the wills of mainstream astronomers. Strauss is not content with telling us the story of Lowell's fascinating life--he portrays each milieu in which Lowell worked and lived with a complexity that gives us the tools to understand Lowell in context.For example, he gives us piquant details about life in the upper reaches of Boston Brahmin culture.One of the more interesting stories is Lowell's move from prominence in academia to the position of crank and critic of the increasing professionalization of astronomy. This is the portrait of a restless mind, worth delving into.